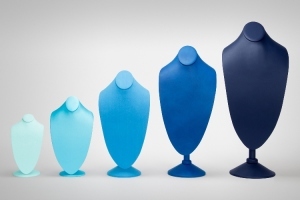 With five sizes available, these neckforms are perfect for any area of your store. Use varied sizes for window groupings, on shelves or niches, in-case presentation, or special event displays. The larger neckforms will highlight your statement pieces and show-stoppers, but can also accommodate ties, scarves, or any neckwear accessory! fabric choice. Visit PN in the JCK Essentials Pavilion #B6581 for more new items!